Let’s face it, investing is difficult, if it wasn’t everyone would be walking around with Warren Buffet sized portfolios and living a jet set lifestyle. Unfortunately, the average sports bettor gets slaughtered every week. Investing in sports without a proven system doesn’t work for the long term. Las Vegas Sports Insider has been built on a foundation of discipline, experience, and logic that employs unique computer modeling combined with fundamental and technical analysis and unbiased money management. A winning combination that has consistently produced winning results for our clients throughout the years. Our approach is to treat sports wagering like an investment. Each day we weight the odds looking for the greatest value in any given line. We perform computer analysis on every matchup looking for disparities that can be taken advantage of. We look at the angles, check weather reports, player injuries, and more up-to-the-minute data. The results – a system that has historically returned more winners than losers. Our previous results are impressive and we’re proud of our achievements, however, no sports service can guarantee returns. Las Vegas Sports Insider does provide clients with a commitment to providing the best sports handicapping service on the Internet with reasoned, researched, and relevant sports investment analysis backed by customer service excellence. 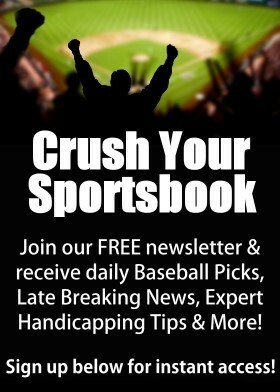 If you decide to subscribe to Las Vegas Sports Insider, you’ll receive more than just winning baseball picks from one of the nations leading sports handicapping services. Low subscription price, excellent track record and winning performance, combined with outstanding customer service equals one thing – Value! Please join Las Vegas Sports Insider for another winning season. If you have any questions please do not hesitate to contact us. Together we can be a success!